One fine afternoon, the most awaited messaged popped up in my mailbox – the list of holidays in the calendar year 2013. Like every employee, I scanned through the document, and found out the days that I could combine to get mini vacations. One such combination was the January 12-14 weekend. I swiftly booked my return ticket on KaSRTC (I was to take a KaSRTC service after really long). Booking for the outbound was still pending. I was planning to work on Saturday and go home on Saturday night. 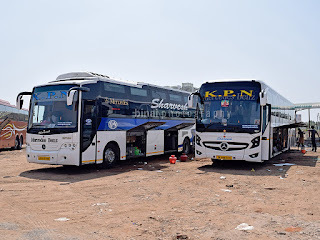 Sometime around the time, my facebook friend told me that Kallada Tours and Travels (Suresh Kallada concern) was introducing the Volvo B11R around the same time – I headed to their website, and saw that reservations were open! I quickly booked a ticket on the bus – the ticket was slightly pricey, but I was okay with the cost. A week went by, and I had a change of mind – why not prepone my journey by a day? I headed to the Kallada website again, and was shocked to find out that my service was cancelled (rather, booking was blanked out). I sent desperate alerts to my contact – he got back saying that it looks like the delivery is delayed. I had no option but to forgo the cancellation charge and book afresh (the other option would be to wait until the last day and ask Kallada to refund the amount in whole). I booked on their afternoon bus via Mysore (since night buses were already full). Days went by, and one fine morning, I receive an SMS that their B11R is getting delivered that day! I expressed my wish to be on the first trip – and my contact blocked a seat quickly for me. I met him later the next day and confirmed my booking – paid for the ticket in cash. Another cancellation charge to my account – the big evil of online booking for people like me who change their plans every now and then. I indulged in some photography of the bus – in fact, went around the bus on a short ride (they were making rounds around the city as a part of promotion). All seats were sold off one day before the journey commenced itself. I was heavily excited on the day of my journey – the only sad point being that my seat was on the first row – so guaranteed that I wouldn’t be sleeping for most of the journey. January 11, 2013 – the maiden journey of a B11R! I reached back at home by around 4pm from office (rather, I had a field posting the day). I left home at around 7pm – much later than my planned 6pm. I had initially planned to leave home at 6pm and take a bus to Madiwala – but like every journey of mine, I ended up leaving home late. A brisk walk to the auto stand, and I took an auto straight to Madiwala. I got off outside the Kallada office (near St. Johns signal – the older office) and headed in to confirm that the bus would be picking up passengers from there. The guy in the office confirmed after asking a couple of people. After I got the confirmation, I headed straight to a nearby hotel for dinner. After dinner, I roamed around for some time, talking to some known people in the area. I headed back to the Kallada office at 2015hrs to get my attendance marked. The office now resembled a peak hour vegetable market – it was packed with passengers. A lot of people were being sent out on pick-up vans (to their new office) while some buses actually came there to pick passengers. The bus: KA-01-AC-40. During the dinner break. My bus – KA-01-AC-40, India’s first ever Volvo B11R to be delivered to a customer – came in at 2030hrs (which was ironically the scheduled departure time). The driver struggled a bit to find some parking place. I remained outside the bus, as other passengers jostled to leave their luggage in the dickey and get into the bus. After the crowd settled down, I got into the bus, only to find a lady passenger sitting on the adjoining seat. I waited for the checker to come in – he came in only around 2040hrs. While he started checking, the bus was moved a bit ahead and parked away from the office – in the meantime, a small speaker kept in the office was blurting out the details of this departure. The checker found out that the lady was booked on another seat and sent her off there. I requested for a seat change, but that did not seem to happen that night. A guy from the office came around to distribute sweets to all the passengers and the crew. The drivers were in full white uniform while the attendant did not have any uniform. After sweets distribution, the crew went to the office to get blankets. The blankets were neatly packed in plastic self-sealable bags. It took a lot of time for the crew to finish distributing the 53 blankets – the bus had 53 seats. After finishing the blanket distribution, they remembered that they hadn’t taken the water bottles! The attendant goes back to fetch the water bottles. Now they remember that they hadn’t picked up biscuit packets! The attendant goes back again, and comes back with packets of Good Day biscuit. As all the commotion gets over, they realise that one passenger hadn’t turned up! They call him – but his phone keeps ringing. Sometime later, the passenger turns up – the crew, thankfully, did not make a scene. Finally, the flag off the bus at 2107hrs – a good 37 minutes late on the maiden trip itself! Both the drivers were trained to operate the B11R at Volvo, and they were proud of their achievement as well. The driver (a young chap – in his late twenties or early thirty) slowly and carefully rolls the bus forward. We take a right turn at St. Johns signal and proceed towards Madiwala market. They were playing an FM station on the radio. The second driver now realises that they hadn’t picked up any DVDs! They call up the Madiwala office and try to find out if they could arrange to send DVDs – but they couldn’t. So the driver decides to buy it from some roadside vendor – but could not find anyone. We slowly crawled past Silk Board flyover, and get on to BETL. The driver slowly lets the beast loose – he switches the Performance mode on the iShift console – the bus responds instantly. It picks speed quickly – once we cross 90kmph, the driver shifts the bus back to the Economy mode. The pick-up reduces, but we steadily progress to 100kmph. A couple of vehicles decide to play spoil sport – the bus handles the situation brilliantly. The driver picked up a DVD from another bus going ahead of us (another operator). He switches on the DVD – the movie plays for some 7 minutes and the entire ENT system automatically trips! After some fiddling about, the DVD switches on automatically. The driver painstakingly forwards the movie to the place where it had stopped – the movie runs for a minute or two, and the system trips again! The crew conclude that the disc is having some problem and decide to try another DVD. In the meantime, we near Attibele toll – we have two Kallada B9Rs for company here – the cleaner goes to one, while the second driver heads to the other. The driver manages to get two DVDs from one bus (Trivandrum B9R). He comes back jubilantly, and puts one into the player. By now, we crossed the toll gate, and pulled over to the left for loading luggage and also pay tax (the MVI was sitting in a car there!!). We remain there from 2155 to 2200hrs – lot of luggage gets loaded, while the second driver comes back with the tax receipt. We crawl out, only to be greeted by a H-U-G-E traffic jam near the checkpost (Zuzuwadi incoming RTO checkpost). A policeman asks us to take the service road – the driver replies that the bus would not be able to go through since we’d ground. The service road was at a lower level and the slope to the road was steep, with a huge crater at the end. The second driver opines that we might be able to go through. The guy at the wheels declares that if another bus goes through without any problem, we’ll follow. A KPN sleeper bus goes through without any problem – so we decide to follow. Now the policeman mocks our driver. The bus slowly approaches the slope – the driver lifts the suspension. We go through comfortably without scraping. We land directly outside the check-post office, where a policeman asks us to stop for checking. The second driver along with the attendant rush off to the office, while the movie slowly progresses. The check takes quite some time – since there was a huge crowd at the checkpost. Traffic was all chocked up. We made a very painful run to Hosur, and stopped outside the Kallada office there for a pickup (2229hrs). Only two passengers were to board – we pick them up and continue the run at 2231hrs. The ENT system tripped again – now the crew understood that the issue was not with the DVD, but was something else. The guy at the wheels slowly picks speed. We pull into the HP fuel station at Shoolagiri (the one with McD and some other restaurants) and we directly stop outside a new restaurant in the complex (Golden Falcon “Dhaba” Restaurant) – 2253hrs. The crew announce a dinner break and rush off to the restaurant (they are on the wheels since 1830hrs – since they had a pickup at Kalasipalya and the bus was parked in Madiwala). I indulge in some photography. An SRM AC Sleeper was giving us company. Around 2315hrs, they move the bus to the fuel station. They tank up fuel for about Rs. 9000. The dispenser had small nozzle and hence refuelling took quite some time. We finally depart from Shoolagiri at 2326hrs. The second driver took over from here, and the first guy shifted to the attendant’s seat. By now, he got information that there were a couple of checking squads on the road. We spotted the first squad standing just beyond the Krishnagiri toll-plaza. Our bus to the extreme right lane. One Viji bus was caught by the squad. We passed the toll, but they did not ask us to stop – we just ran through. Traffic was quite heavy till we crossed Krishnagiri. After Krishnagiri, the road freed up and the driver slowly increased speed. The Viji B9R came behind and honked madly – our driver was in no mood to fight (he was driving a brand new 1.5cr worth machine) – so he just pulled to the left and let him go. There was one Kallada non-ac bus (KA-52-7200) heading to Kodungallur, who gave us a good run. That fellow’s tail appeared to be on fire as he kept increasing speed. The first driver now came and occupied the seat next to me – he fell asleep in no time. I was finding it hard to sleep in that seat – there was no curtain in the front (the new design of the cabin and the excessive use of FRP panels made it difficult to fix the brackets for holding curtains). I fell asleep every now and then, but not continuous. The driver was very composed – absolutely no use of horn. The iShift was doing wonders with the bus – I’ve never enjoyed iShift so much. The gearing was perfect, and the tachometer always remained in the green zone (1000~1900 rpm). I dozed off for some time, and woke up just as the bus neared the massive flyover at Salem – this is where NH47 (now NH566) officially begins. The bus handled the 270* curve with ease – absolutely minimal body roll, and it held to the road really well even as the driver maintained decent speeds – I am really impressed with the capabilities of this bus. The driver too was elated with what he experienced. I dozed off after we were on the highway to Ernakulam. I woke up just when the bus passed a speed breaker – it was a two-lane road. We were now heading towards the fuel station at Perundurai (All Kallada buses going through this route refuel from here) – we reached the fuel station at 0253hrs. There were two Kallada B9Rs already there. I used this break for a short stroll, and also to use the restroom. The driver was hurrying with the refuelling – unlike the regular practice, he did not waste time in chit-chatting with the crew of the other buses. Other drivers came into our bus to see what was special. We started off at 0308hrs – I think this is the fastest ever for Kallada at this fuel station. We had taken in some 300-odd lts of diesel. The driver quickly made progress and we were back on the highway. 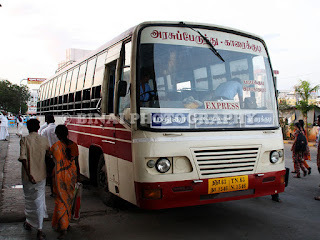 The bus took a left turn at Chengampalli and headed towards Tiruppur. The driver and the cleaner were busy discussing if the bus would be able to handle some curves in the town. On overhearing their discussion, I decided to stay awake to see the way the bus handles the curves. The road was two-laned all the way, with fairly good surface quality, and absolutely no traffic. There was a tight speed-check barricade on the way – the bus handled it effortlessly. Then came the dreaded curves in Tiruppur town – it was a 90* turn to the right, with a 3ft high concrete divider in the centre. I was expecting the driver to go straight, stop, back and then finish the curve – but the bus handled the curve in one single go – thanks to the steerable tag axle. I was so content seeing the way the bus rode, that I fell asleep without any struggle! It was one deep sleep. I woke up just when the bus stopped at Walayar checkpost – 0455hrs. The driver sleeping next to my seat also jumped up. The crew got off the bus – one of the two drivers (the guy who was driving) walked off to the checkpost to pay the tax, while the second driver headed to a nearby tea stall. The attendant was busy filling water in the windshield washer tank. I took a short stroll, and remained outside the bus. In the mean time, two Kallada B9Rs headed towards to Kerala. The SRM Chennai-Thiruvalla B9R also went past. 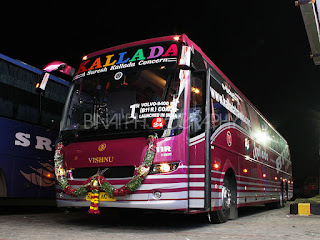 Sometime later, one Kallada B9R towards Bangalore (the late night Trivandrum-Bangalore bus) also went past. The non-AC Kallada bus to Kodungallur also went past – that means this guy was almost on our tail all the time! We started off from Walayar at 0520hrs – tax payment takes quite long, and the weekend/festive crowd added to the misery. The young chap (first driver) was now at the wheels. This guy was quite energetic, and this fellow was enjoying the iShift in every sense. By now, Kerala was waking up and roads started getting crowded. We stopped at Palakkad bypass for a passenger drop, at 0541hrs. The bus took the route via Alathur, Kuthiran. I dozed off for a while, but the horrible roads woke me up. The ride was slightly better than the B9Rs – but not major difference. The driver had a horrible time overtaking slow moving trucks on the road – heavy traffic and the length of the but added to the driver’s misery. The bus is a good 14.5 metres long. This being the first trip, the driver had his limitations in taking risk as well! I was finally dropped at Mannuthy bypass, at 0658hrs. Although the website mentions a town drop, I did not insist on it since the bus was already too late. End remarks: The bus, KA-01-AC-40, had only 335.7 kms on the odo when we started off from Madiwala. I am not commenting on the maintenance – the bus was on its first trip anyway! The end-to-end running time was about 9hours and 51 minutes – high by any standards. But a point to be noted is that the bus lost over 85minutes in breaks/waits itself! Both the border check posts ate a lot of time – so did the dinner break and two refuelling breaks. The drivers did not make any unwanted breaks over the run (+100 for that). Both the drivers were conscious about time, and they wanted to maintain punctuality. The departure was delayed by over 35 minutes – the office staff at Madiwala could’ve reduced this delay by working more proactively – they wasted a lot of time in checking tickets and distribution goodies. I cannot comment more on the service since it was on its first day, and it is still to set a time schedule. Will I take this service again: This was a journey solely to try the product. I did like the service, but Kallada needs to pull up their act and concentrate more on punctuality. 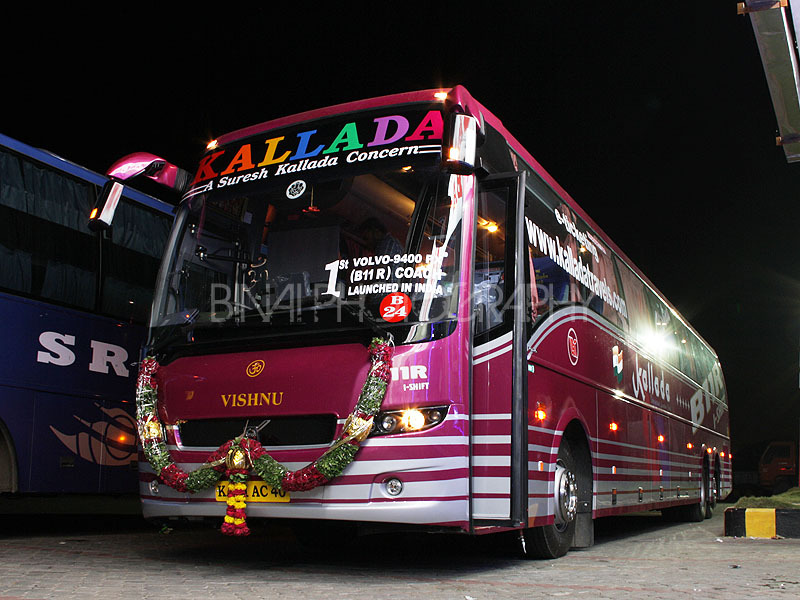 So Kallada becomes the first operator to start B11R service. A good option would have been to provide 48 semi sleeper seats and a small toilet and driver berth instead of squeezing in 53 seats. This reminds me of my first trip in G4's TVM B9R (Yellow Liner) during its initial days, when the crew lost to elsewhere by entering Palakkad Town. We made a wrong way to get into Ottappalam Road quickly and due to which we had to reverse about more than a kilometer through narrow roads. An hour was lost in chaos. B11R's ishift seems perfect than B9R ishift....The way the crew behaved with the bus seems excellent. Its good to provide water and snacks considering the heavy amount paid. Online booking is the worst thing if the dates are flexible. Book online only if dates are 100% fixed. Checking-Seems MVI and Highway Police had become more serious now, for I have never seen a checking at Hosur or Krishnagiri barring dates of Mullaperiyar issues. Taking 10 hrs to Thrissur is not good-its Airavat timing-although this can be pardoned in the current situation. Simply losing time at Madiwala itself should be corrected. 53 seats sit quite comfortably in a B11R. Adding a toilet+berth+48 seats would be really cumbersome - a toilet would eat in two rows - i.e., 4 seats less. A berth means revenue loss of 5 seats. As an operator who spends 1.5cr on the bus, they cannot afford to waste so many seats - no passenger would pay extra because the bus has a toilet or the driver gets a berth. I was also in this bus along with you. it was a wonderful journey. you forgot about the incident in which they took an illegal U-turn at madiwala and had to bribe the police in their maiden trip, within minutes from the start of journey. Yesterday I travelled in a Kallada B11R (service number B24) from Ernakulam to Thrissur (via Mannuthy, Palakkad, Coimbatore, Salem). The B11R bus KA01AC130 arrived at Vyttila corporation building in Ernakulam 30 mins late. The bus condition was good. AC was working fine, seats were clean, but no snacks were provided. At 12am they stopped at some local hotel for having food. And after 20mins they started moving. At 1:30am, the bus stopped at a deserted junction in Perundurai (near Combaitore, off the National Highway), and waited there for 30mins. After that, suddenly they switched on the lights, and asked all the travellers to get our of this bus and shift to a Kallada B9R which was parked just behind our B11R. Later when we asked the staff as to why this is happening, they didnt answer anything. When we asked whether the bus broke down, they said (Aaa athey athey athey) (meaning Yes yes yes in malayalam). But the thing is, that some other people were getting into this bus!!! The bus was completely fine, as they accomodated some other people inside our B11R bus and started moving. Our B9R started moving after 20mins. The staff were talking loudly and also were playing Tamil songs on their phone. To keep up with time, the driver started lugging the engine badly and drove rashly. 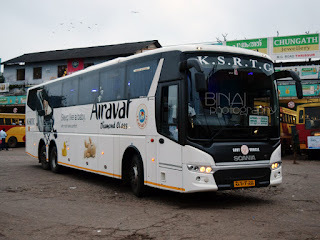 At 6am (30mins early), we reached Madiwala, and when we got down, we were surprised to see the pink B11R in which you travelling (KA01AC40) standing right in front of our B9R with its engines switched on! I guess it would have been the Ekm-Blr B11R which starts from Ernakulam and goes through Inrinjalakuda and Thrissur (NH66) and arrives Blore at 6am. And in January too we had booked a Kallada Scania from Thrissur to Bangalore, but what we got is an old Kallada B9R which arrived 1hr late! We are never gonna travel in Kallada again.